One of the hottest destinations across the world, The Netherlands is a happening choice for all, especially the youth, who flock the country for its vibrant nightlife, cultural, and heritage experiences. Needless to say, to compliment such endeavours, the hotels in Netherlands should be top notch too and they are! 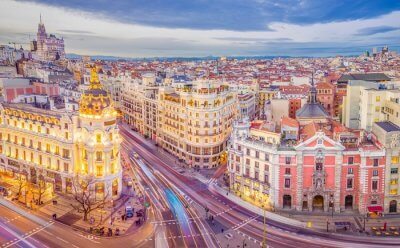 So if you’re planning a holiday to this wonderful country, we have a perfect list of accommodations that you would like. One of the best hotels in Netherlands, the Conservatorium is walking distance from the Van Gogh Museum and even has a Van Gogh Suite. This Neo-Gothic style hotel is one of the finest in the whole country and has classy wood interiors to match its vibe. From top of the line suites to the best diners in the city, you cannot go wrong with this hotel. So if you’re one of those who craves for an experiential stay and is not afraid to spend, then this hotel with its indoor pool and hammam is one of the most exclusive accommodations that the country has on offer for you. 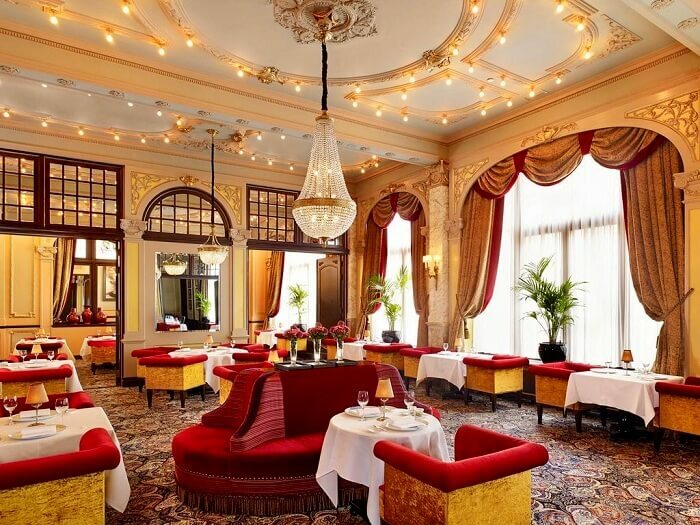 If old world luxury and charm is what you crave for then look no further than the Waldorf Astoria Amsterdam. Located in several canal side palaces, the hotel is chic, elegant, and aptyl depicts the 17th century palace vibes where it is located. Another one of the most centrally located hotels in Netherlands, the Waldorf Astoria offers period interiors in some of its best suites, an indoor pool, and fitness centre, and many wonderful dining and drinking options. 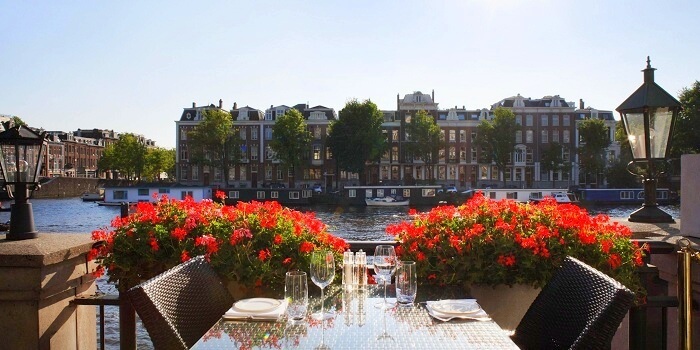 Set inside a 19th century building, the InterContinental Amstel Amsterdam as the name suggests is an Amstel river facing hotel with signature InterContinental luxury and experience. The 5 star hotel in Amsterdam is centrally located and is at a walking distance from the iconic Van Gogh Museum. It features modern luxury in a classic facade and one can expect only the finest experience here when it comes to food, dining, and of course hospitality. In other words, this is the safest bet out of all the hotels in Netherlands. This is one of the finest 4 star hotels in Harleem and overlooks leafy park when it comes to views. Expect classic luxury and top notch hospitality from this one and if you’re looking to spend the some time at the beach, the nearest one is just 9 km away from this hotel. 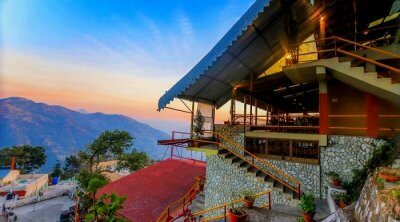 One can also dine on the terrace or enjoy a drink or two at the well stocked whiskey bar. 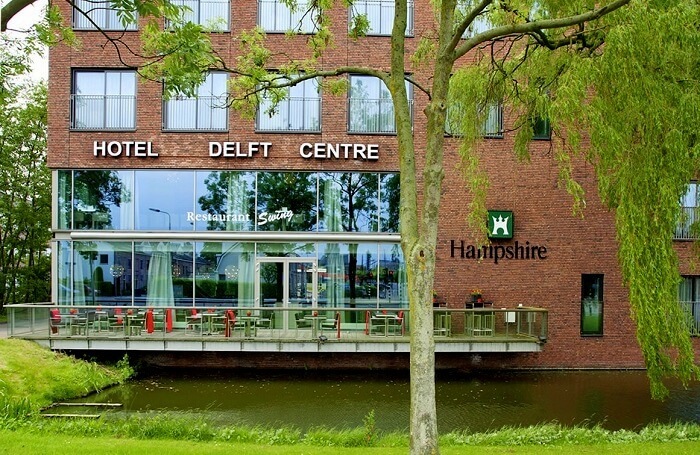 The Hampshire Hotel in Delft Netherlands overlooks a canal and is set inside a 10 story red brick building. The hotel has various music themed touches all over along with classic luxury and excellent hospitality. There is fine restaurant serving Dutch and French cuisine and one also has an option to dine at the terrace. 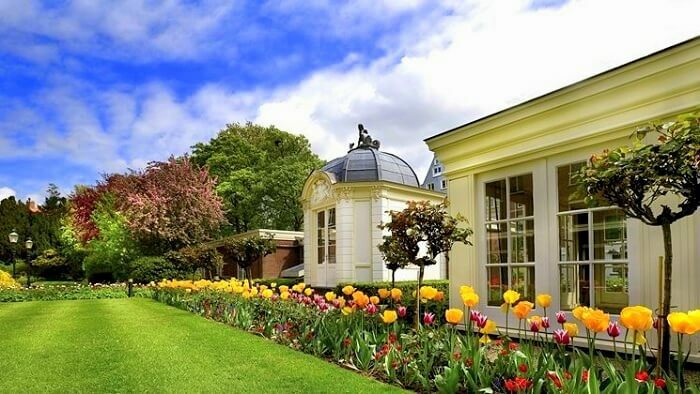 Located in one of the best places in Utrecht, the Medieval Centre, the Grand Hotel Karel V is an excellent 5 star hotel in Netherlands that not only offers best of luxury but also a green and serene ambience. 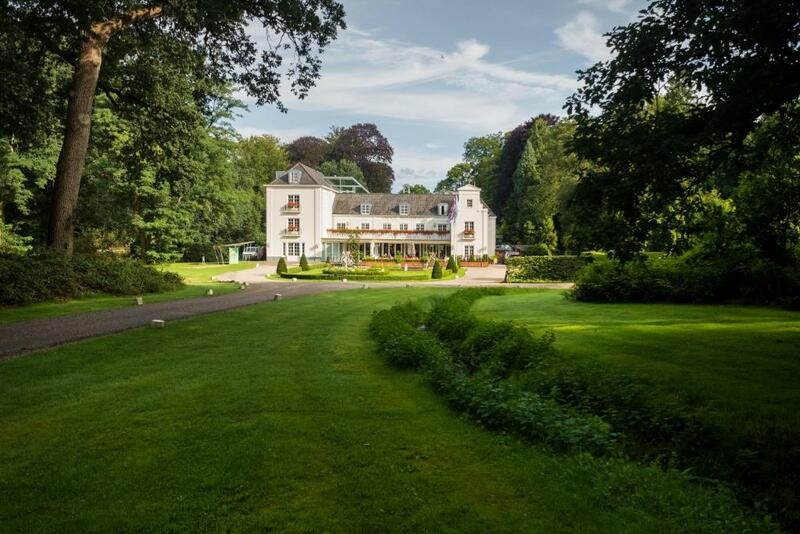 So if you’re one of those who is looking to relax on a holiday in Netherlands, then this cozy property is the best you can get. And yes, you can enjoy a fine cup of tea in the gardens as well. 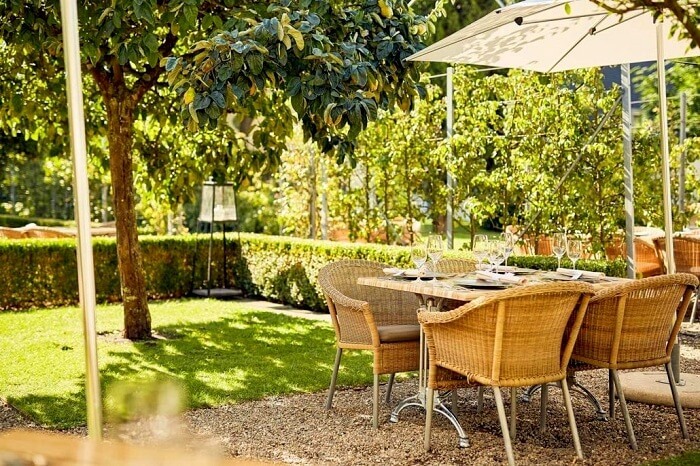 The Landgoed Hotel & Restaurant is located on a 750 hectare country estate and offers a cozy experience to its guests. The rooms are modern and stylish and there is a fine restaurant serving French and regional cuisine. One can also go on walking trails, enjoy cycling, rent bikes, and take horse riding lessons. This chic 5 star hotel in The Hague is set inside an 1858 building and true to its iconic charm offers an experience that reeks of nostalgia and old world luxury. Apart from all the usual luxury quirps, the hotel also features a spa with a steam room and sauna. 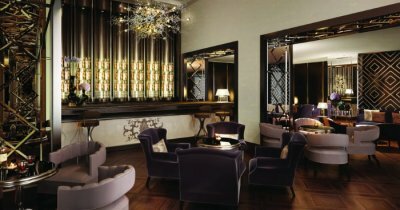 There is a cigar lounge and a cocktail bar along with a grand restaurant serving French and Italian cuisine. Guests can also enjoy a refreshing swim at the indoor plunge pool. Located inside a 15th century brick building, this hotel is all about that cozy experience. Featuring rich decor and a Parisian style restaurant with garden terrace, staying here will take you back in time and give you that old world vibe. 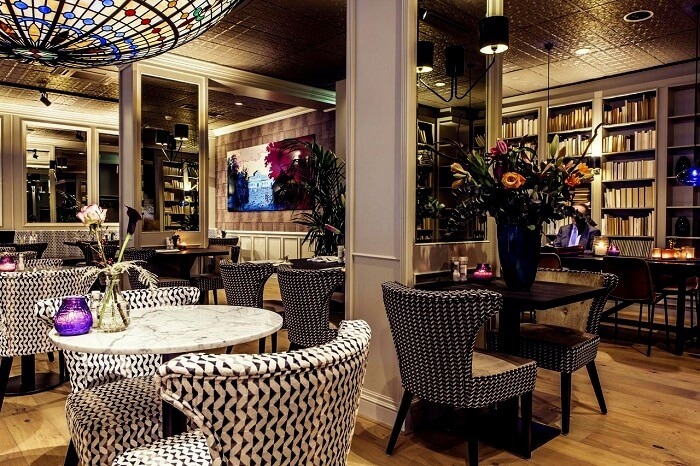 Enjoy a drink at the lounge bar or sit beside the fireplace when it gets too cold outside. 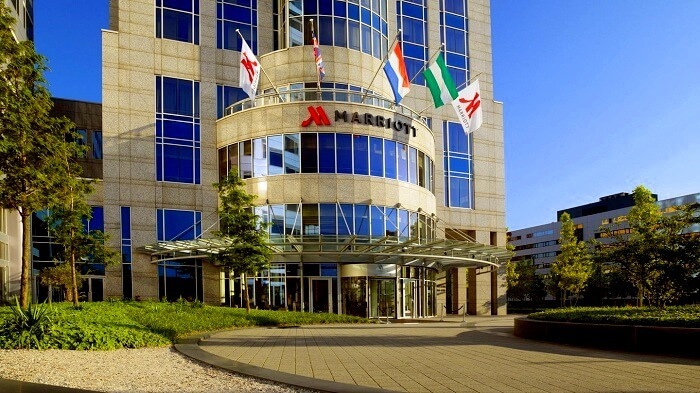 The only 5 star hotel in Netherlands in this list that looks modern, the Rotterdam Marriott Hotel occupies the first 15 floors of a modern high rise building and offers spectacular views. This sophisticated hotel also features a cocktail lounge, brasserie, and a cafe along with 8 meeting rooms and yes, a gym too! Q. 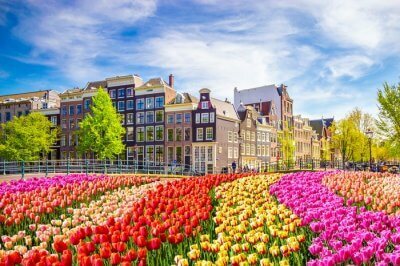 Which are the best hotels in Amsterdam, Netherlands near the train station? A. Park Plaza Victoria Amsterdam, art’otel Amsterdam, The Old Nickel Hotel, and NH Collection Amsterdam Barbizon Palace are some of the best hotels in the Netherlands that are situated near the central station. Q. Which are some of the top family hotels in Netherlands? A. Hotel Sofitel Legend, Hotel Estherea, Rotterdam Marriott Hotel, and Hotel Casa Amsterdam are some of the top hotels for families in Netherlands. 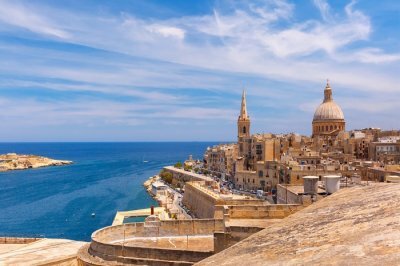 From offering luxury to homelike comfort, these places surely guarantee an unforgettable experience. Suggested Read: Wish To Spend Flawless 3 Days In Amsterdam?! Here’s How To Do It! Looking at all of the above accommodation options, it is clear that a holiday in Netherlands would surely be filled with luxury and fine experiences. 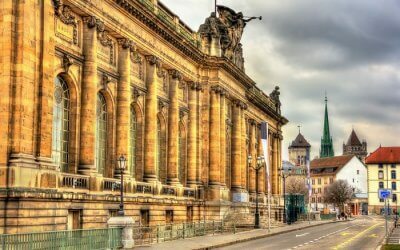 We would also recommend you to book a Europe Tour Package from TravelTriangle and enjoy more such hotels and experiences with your customized itinerary.